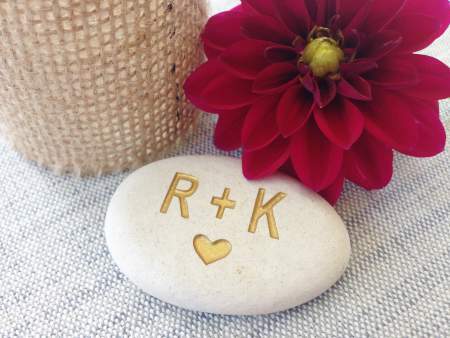 Engraved stones and etched rocks make a beautiful addition to any wedding. Incorporate them into the ceremony or reception in a number of ways for memories that the new couple will take with them for the rest of their marriage. Table Settings - Add that special touch to your centerpieces with a few engraved rocks. With words like “Love” and “Dream,” the stones bring a little romance and whimsy alongside the flowers. Names - Placed around the tables of the reception, stones with words like the names of the newly married couple, their monogram or a simple “Mr. & Mrs.” will enhance the party mood. Guest Favors - As an alternative to matchbooks or candy, give each guest stones with words like your favorite quote about love, or perhaps a sacred text used in your ceremony. Add your names and wedding date to the backside, so they will always remember where the sentiment came from. Gifts for Wedding Party/Parents - Engraved stones can make practical and attractive gifts that also remind people of a special event. Larger stones are great stone paperweights, and when personalized, will let wedding participants and parents know how much you appreciate their involvement. Remembrance for Couple - Each guest can take an etched rock as they enter the wedding, and hang on to it throughout the ceremony. Then at the end, the stones can be collected for the new couple to represent all the best wishes of their friends and family. Symbol Stones - There are so many symbols of love, from the basic heart to the Irish Claddagh. If there is one or several that have special meaning to you, engrave them on stones and incorporate them into the ceremony or reception, or give them as favors to guests. These will truly be love-engraved stones. Prizes for Guests - Some wedding receptions get quite lively with games and theatrical displays. Encourage guests to participate by offering fine engraved stones as prizes. These could also be nice for bridal shower games. “Our New Address” Card Holders - Typically used for business cards, these holders are a great way to share your new address with friends and family. Set a few around, maybe on the gift table and by the guest book, to ensure everyone can grab one. Beverage Stones - These make another great gift for the wedding party, or could be classy guest favors. If you are serving cocktails, have the bartender use Basalt cubes with your monogram instead of ice cubes, and then afterward, you’ll have a nice collection of etched rocks for your home bar. Wedding Photo Frame - Select from pre-engraved and custom stones to create a collection that represents your new marriage. 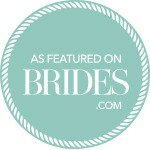 Then, affix them to a photo frame for your wedding picture—a great display piece that will last a lifetime. Coasters - Line the bar with coasters featuring your names, wedding date and anything else. Or, engrave favorite sayings about love, perhaps about how it ages well, like a fine wine. Memento from the Church or Synagogue - If you are a place of worship that’s officiating the wedding, keep a collection of stones with words on hand with messages and images on marriage. Then, after the ceremony, you can offer the new couple the chance to select the message stones that best represents their experience that day. Wedding Tic-Tac-Toe - Looking for a game for guests to play at the wedding? Tic-tac-toe is casual and easy for all ages. Better yet, the X and O represent hugs and kisses! Place a few sets of stones engraved with the letters around the reception to encourage laughs and conversation. Unity Symbol - As an alternative to the traditional unity candle, use stones with unifying symbols or words. These etched rocks could have the couple’s initials or be message stones that the church or synagogue provides as an option to all couples. 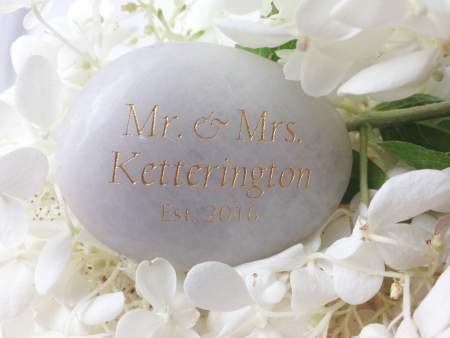 Add something unique and meaningful to your wedding with lovely engraved stones. Whether they stay with the couple or go home with the guests, they'll remind everyone of a day full of love and excitement.